With a total area of almost 2.8 million square kilometres, Argentina is eleven times larger than the United Kingdom and has a population of approximately 43 million compared to the United Kingdom’s 64 million. Within its 3,650 km length and 1,430 km width, you will find in Buenos Aires, the most sophisticated and European city in South America; at El Calafate the World’s third largest ice field; at Iguazu the most spectacular waterfalls in the world; in the northwest unusual landscapes, salt flats and vineyards; in Patagonia, the mighty Andes rising to 6,962 metres; in the lake district of Bariloche superb hiking; in Ushuaia, the southernmost tip, the gateway for cruises to Antarctica and, in the far northwest, the enormous Ibera wetlands. Then, of course, this is home to the Tango and the gauchos and the enormous estancias. This was the country of Evita Peron, the birthplace of Che Guevara and passions run strong. The ‘Classic Argentina’ itinerary will give you a flavour of this fascinating country. We have tried to build in some leisure time at the same time as enabling you to explore the main attractions and regions. Arrive at Buenos Aires international airport. Private transfer on arrival to The Sofitel Buenos Aires Recoleta Hotel in Buenos Aires for 3 nights on a bed and breakfast basis. The 4 star The Sofitel Buenos Aires Recoleta Hotel is located in the upmarket district of Recoleta and is the perfect hotel where to relax after a long transatlantic journey. Trendy cafes, boutiques and restaurants abound. The hotel’s 175 stylish, spacious rooms and suites all have complimentary tea and coffee making facilities. It has a very good heated indoor pool, a health club and a secret garden. We understand from our travellers that the breakfast here is excellent. From the hotel it is an easy stroll to the cemetery of Recoleta where you will find the tomb of Eva Peron. Overnight stay at The Sofitel Buenos Aires Recoleta Hotel. After breakfast, a half day private guided tour of the city. Located on The River Plate, it’s the sophistication of this capital city that is most noticeable. Noble buildings, wides avenues, gracious squares and parks are everywhere. People in Buenos Aires have style, they dress well and they care how they look. The Plaza de Mayo at the city’s centre is fringed with 19th century buildings including Casa Rosada, the presidential palace. The Teatro Colon and the Metropolitan cathedral are also magnificent. The district of San Telmo is where you will find Spanish colonial architecture and in complete contrast the brash, multi coloured, corrugated iron buildings of the district of La Boca are fascinating. Buenos Aires, with an urban population of almost 3 million and a metropolitan population of 14 million, is an enormous melting pot of cultures, dialects and different ethnic groups. This is one of the world’s most captivating and pulsating cities. In the afternoon, do relax in one of the wonderful cafes and just watch the people come and go. In the evening we have included a tango show - which is simply electrifying ! You can continue exploring Buenos Aires or you could visit Colonia del Sacramento in Uruguay. The sailing, by fast catamaran, from Buenos Aires takes approximately 1 hour 10 minutes across the River Plate. With a population of 27,000 Colonia is the oldest town in Uruguay and is renowned for its historic quarter, an old Portuguese settlement, which is an UNESCO World Heritage Site. Colonia is something very different, easy to reach and very rewarding. After breakfast, transfer to the airport for your flight south to Ushuaia (approximately 4 hours). On arrival a private transfer to the Lennox Hotel (approximately 15 minutes) for 2 nights on a bed and breakfast basis. Ushuaia, located on the Tierra del Fuego archipelago opposite the Beagle Channel is about as far south as you can go. It is virtually at the end of the earth and certainly feels like it. This is very much a windswept, shanty town in nature, a ‘setting off’ place, a place where adventures begin. The town, with a population of 57,000 has a bleakness about it and the light is somehow different too. The 3 star Lennox Hotel, located in the heart of the town, has 30 simply furnished rooms, all with ocean views overlooking Ushuaia. The port is a 4 minute walk and the 25 de Mayo Square is also close by. A good base for short stays in the town. Overnight stay at the Lennox hotel. After breakfast join a group guided tour of the Lapataia National Park. Lapataia Bay is about 20 kilometres from Ushuaia. The Bay is approached through forests of beech and evergreen trees and is protected by a microclimate created by the presence of the Andes Mountains. This is a good bird watching area and, if you are lucky, you might see a condor. The National Park is classed as a subantarctic forest. The scenery within the park is dramatic, with forests, waterfalls and mountains. The lower reaches of the park are home to 20 species of mammals including the Guanaco, Andean fox, north American beaver, European rabbit and muskrat. In the afternoon there is a cruise on the Beagle Channel ( 240 km long and 5 km wide), from where the views to Ushuaia and the mountains and forests beyond are quite magical. The channel separates the larger main island of Isla Grande de Tierra del Fuego from various smaller islands. The Channel's eastern side forms part of the border between Chile and Argentina. The straits of Magellan and the Beagle Channel are two of the three navigable channels around South America between the Pacific and Atlantic Oceans. Private transfer from the Lennox Hotel to Ushuaia Airport (approximately 15 minutes) to fly to El Calafate (approximately 1 hour 30 minutes). On arrival private transfer to Posada Los Alamos (approximately 25 minutes) for 2 nights on a bed and breakfast basis. The 4 star, alpine style Posada Los Alamos is a short walking distance from the centre of Calafate. The accommodation is made up of comfortable and cosy standard rooms, studios, triple rooms and junior suites. The La Posta restaurant serves both regional and international cuisine. One of their specialities is Patagonian lamb. The Humus cocktail bar is a wonderful spot and boasts wonderful views of the Andes. Needless to say, the hotel has a very good stock of excellent Argentinian wines. Overnight stay at Posada Los Alamos. The small town of Calafate is the gateway to exploring the Upsala Glacier, Onelli Bay and Los Glaciares National Park where the unique Perito Moreno Glacier is located. From Calafate one can access El Chalten (approximately 3 hours) which is at the northern tip of the National Park and the base camp for some spectacular treks into the Andes, especially Mount Fitzroy’s granite turrets which rise up from the steppe. 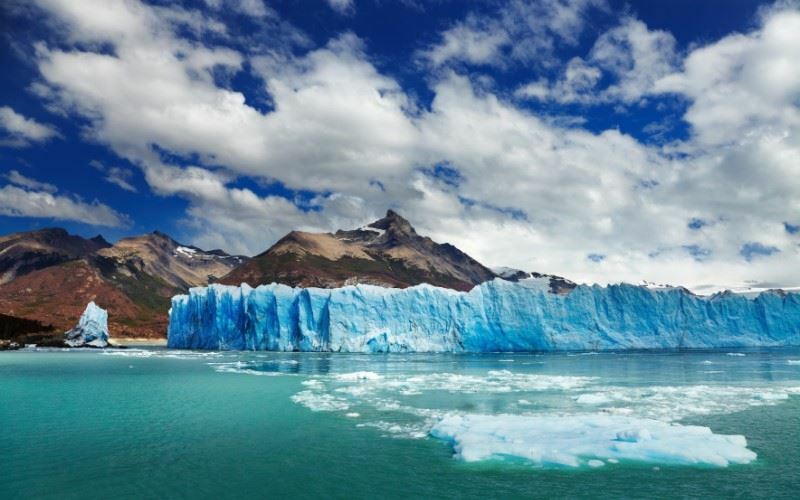 The full day guided tour with lunch includes the Perito Moreno Glacier (78 kilometres from Calafate) which is a 250 square kilometres in area, 30 kilometres long and 5 kilometres wide when it enters Lake Argentino. The Perito Moreno is, uniquely amongst glaciers, still advancing. There are a great many viewing platforms and easy trails from which to view the glacier which is one of the wonders of the world. The front of the glacier is as tall as a block of flats and the noise, when a section breaks off, is like an explosion. After lunch, the glacier is approached by boat (about 1 hour ) through the icebergs that have broken off - a wonderful afternoon tour. After breakfast, private transfer to the airport (approximately 25 minutes) and then a flight to San Carlos de Bariloche (direct flight 1 hour 45 minutes or approximately 7 hours via Buenos Aires). On arrival private transfer from the airport to the Llao Llao Hotel Resort, Golf and Spa (approximately 1 hour 10 minutes) for 3 nights on a bed and breakfast basis. The Llao Llao resort is a very famous hotel built in a grand alpine style, suitable for both summer and winter. It is 25 kilometres from Bariloche (approximately 40 minutes). Originally built in 1940 (Bustillo Wing) a more contemporary luxury wing (Moreno) was added in 2007. Beautifully situated overlooking the Nahuel Huapi and Moreno Lakes, the hotel boasts 6 restaurants, indoor and outdoor swimming pools, an 18 hole golf course, spa and a host of other facilities and activities. At this hotel one can appreciate all that the beautiful Bariloche region has to offer. Overnight stay at Llao Llao Hotel Resort. After breakfast a half day group guided tour of Bariloche’s scenic surroundings. Bariloche is known for its Swiss style alpine architecture. It is located in the foothills of the Andes within Nahuel Huapi National Park and on the shore of Nahuel Huapi Lake. It is a major base for skiing, trekking and mountaineering and surrounded by stunning alpine scenery. With a population of around 110,000 it has many restaurants, cafes and bars and a great many chocolate shops for which the city is known. Bariloche is the tourist centre for the Argentine Elite. Your afternoon is free to relax in your hotel or book one of the many activities on offer. What better place to ‘chill out’ other than the Llao Llao hotel or, if you are a golfer, there is an opportunity to play on their course in magnificent surroundings. Transfer to Bariloche Airport (approximately 1 hour 10 minutes) and then fly to Cordoba (direct flight approximately 2 hours or 4 hours 15 minutes via Buenos Aires). On arrival private transfer (approximately 1 hour 20 minutes) to Estancia Los Potreros for 3 nights on a full board basis. 6,500 acres is a lot of land but this is the size of a working cattle ranch in the heart of the district of Cordoba. There are 7 tastefully furnished rooms and lunch and dinner are taken with other guests at the family table hosted by one of the family members and with ample opportunity to question how the estancia works and what life is like in such a place. Overnight stay at Estancia Los Potreros. You have two days at leisure with activities organised by the estancia. Many of these are horseback based but do not worry if you have never ridden before as the horses are very accommodating. The estancia caters for both the novice and experienced rider. However, there are also ample opportunities for walking, photography, bird watching, seeing how the estancia works or simply just relaxing by the pool or in the gardens. Transfer to the airport (approximately 1 hour 20 minutes) to fly to Iguazu (approximately 2 hours). On arrival private transfer to the Mercure Iguazu Hotel Iru (approximately 25 minutes) for 3 nights on a bed and breakfast basis. Set in the Iryapu jungle close to the Argentina/Brazil border, this modern and comfortable hotel is located just 20 minutes from the falls. There are 100 rooms with contemporary furnishings and feature private balconies with jungle or pool views. Hotel amenities include a stylish restaurant with terrace, lobby bar and an outdoor swimming pool and bar. Overnight stay at Mercure Iguazu Hotel Iru. You are in a perfect location from which to explore the falls, one of the greatest sights on earth or simply relax in the hotel grounds. Set in the Misiones Province of Argentina and the Brazilian state of Parana, the Iguazu Falls defy description - they simply have to be visited. This is the largest waterfall system in the world. The longest waterfall drop is 82 metres. There are 275 individual waterfalls over a total width of 1.7 miles. For those who are interested in the fate of the 16th century Jesuit missions in the Misiones province of Argentina, there is an excellent film called ‘The Mission’ starring Jeremy Irons, Robert De Niro and the Iguazu Falls of course, with a magnificent soundtrack by Ennio Morricone of ‘The Good The Bad and The Ugly’ fame. Private transfer to Puerto Iguazu airport to fly to Buenos Aires (approximately 2 hours) or travel across the border into Brazil to Foz do Iguacu airport to either fly to Sao Paulo (1 hour 40 minutes) or Rio de Janeiro (2 hours) for your return flight back to the UK. Located in the upmarket neighbourhood of Recoleta, The The Sofitel Buenos Aires Hotel is a stylish hotel that is characterised by its excellent cuisine and friendly service. Located in the upmarket neighbourhood of Recoleta, The Sofitel Buenos Aires Hotel is a stylish hotel that is characterised by its excellent cuisine and friendly service. It features 175 elegant and well appointed rooms all with a welcoming and warm decor. The amenities include the Agraz Restaurant, the Tea Lounge, Cheers Bar, La Patisserie as well as an indoor pool, health club, and a sauna. The The Sofitel Buenos Aires Recoleta Hotel is within a short walk of a variety of boutique shops, trendy cafe and excellent restaurants. This small intimate hotel is located on Avenida San Martin in the heart of Ushuaia. It is a short walk from the Beagle Channel waterfront and restaurant district. The hotel amenities include the Buena Vista Bar and Lounge located on the top floor where guests can savour Patagonian cuisine or enjoy a drink whilst admiring the views across the city and the Beagle Channel. The most comfortable hotel in Calafate, the Posada los Alamos, situated in the heart of Calafate, has 144 well appointed and tastefully decorated rooms, some with garden and mountain views. There are 140 standard rooms including triple and interconnecting rooms and 4 finely decorated suites. The elegant suites each have 2 bathrooms, private jacuzzi and king size bed and pretty garden views. All rooms have mini-bar, safety deposit box, room service, individual heating, cable TV, hairdryer, direct dial telephone and private bathroom (with bath and shower). A new health suite is due to opened in 2006 which includes an indoor pool, sauna and gym. Facilities include a bar, 'La Posta' restaurant serving regional and international dishes including green salads from their organic vegetable garden, golf (9 hole putting green), tennis and a library. Open all year. Highly recommended. Surrounded by the dramatic Cerro Lopez and Tronador Mountain peaks and overlooking the beautiful Nahuel Huapi and Moreno Lakes, Llao Llao is one of South America’s renowned hotels. Surrounded by the dramatic Cerro Lopez and Tronador Mountain peaks and overlooking the beautiful Nahuel Huapi and Moreno Lakes, Llao Llao is one of South America’s renowned hotels. Dating back to 1938, the original hotel (Bustillo Wing) was built in a grand Alpine lodge style with exposed cypress timbers, chandeliers, wood panelled walls and massive stone fireplaces. In 2007 a new luxury wing was added (Lake Moreno wing) with direct views to Lake Moreno. This new wing has its own private access for guests, it is connected to the original building by a series of carpeted walkways and lifts. In keeping with its age, the rooms in the old part of the hotel vary in size and have a more traditional style. The rooms in the newer Moreno Wing have exposed wooden flooring and a more contemporary feel. As you might expect from this landmark hotel, it has excellent facilities including its own 18 hole golf course, indoor and outdoor heated swimming pools and a variety of dining options offering regional Patagonian and international cuisine. Other amenities include the Nahuelito’s kids club, a games room (with arcade games and pool tables) and a beauty salon. All rooms have a private bathroom (bath or shower), luxury toiletries, hair dryer, flat-screen TV, telephone, desk, mini-bar, wifi and safe deposit box. Due to its age the rooms in the Bustillo Wing do not have air-conditioning. Indoor and outdoor swimming pools. Estancia Los Potreros is an exclusive 6,500-acre working cattle farm, located at the top of the Sierras Chicas in the heart of the beautiful region of Córdoba. Accommodation on the farm is simple and traditional, but provides guests with all creature comforts. Rooms are individual and tastefully furnished in keeping with the history and style of the estancia, and have their own private bathroom. Meals are European in style, with plenty of local favourites including the traditional Argentine 'asado' or barbeque. Lunch and dinner are taken together at the family table, usually hosted by one of the owners. With a maximum of 12 guests, you receive a truly personal experience. The main activity for guests is exploring the countryside on horseback. Young or old, experienced or novice, the riding can be experienced by just about everyone. The horses are ridden 'Western style', in a relaxed manner with loose reins, and this style of riding is very easy to pick up for the less experienced. Every day at the estancia is different, and guests are encouraged to watch or participate in the daily activities of the farm. Whether your passion be outstanding horses, beautiful scenery, walking, photography, bird-watching, soaking up the local culture or simply enjoying good company in a truly unique setting, Estancia Los Potreros has something for everyone. Set in the Iryapú Jungle close to the Argentine/Brazil border, this modern and comfortable hotel is just 20 minutes from the Iguazu Falls. The warm sophisticated rooms have polished wood floors, contemporary furnishings and feature private balconies with jungle or pool views. The hotel amenities include a stylish restaurant with terrace, an airy lobby bar and an outdoor swimming pool with bar. Other amenities include a gym, a sauna and a hot tub, as well as massage services and bike rental. All rooms have a bathroom (shower), hairdryer, cable TV, work desk in all rooms, telephone, Wi-Fi internet connection, safety deposit box and mini-bar. Some junior suites inter-connect with standard rooms.